Showing results for tags 'mag'. - Brian Enos's Forums... Maku mozo! I have a Tanfoglio Limited Custom .40S&W with an IPSC box conform setup. I use K40 magazines with Grams spring/follower and Xtreme Base Pads. This setup holds 18 rounds. I didn't cut off any coils and the springs are new. Unfortunately, I ran into an issue that prevents the mag from a free drop. After firing a round the top round in the magazine travel forward and stuck on the ramp. See also picture below. I already polished the underside of the slide and broke the edge on the front which catches the round in the magazine. I have no clue what causes this issue. Making a mag fit the gauge. How to? SV tube. TTI guts and 3g basepad bought as a "ready to go" magazine. Two of them I have that I bought new do not fit the gauge. Rather than pay the 15% restocking fee ($39) and shipping ($10) to return them I want to make them work. I find tons of posts about tuning feed lips and springs and followers but not much about getting them to gauge beyond 1. filing down the base pad or 2. filing down the feed lips. These are already small basepads and it looks like the lips were worked on when the built the mag, as to me there isn't a ton of "extra" material there for filing down. So what else would you do to get mags to fit the gauge? Has any one gotten their hands on the new STI mag tubes and if so what do you think. I want to replace a couple of my older mags and am looking at either these or MBX. I am shooting 38SC in a std SVI plastic Grip. I've been doing some dry fire with my PCC lately. While practicing reloads I've noticed my mags are starting to or are chewed up on the over travel stop ledge. I'm wondering if anyone has encountered this and if they have a solution? The edges of the over travel stop in the lower seem kind of sharp, so I may stone them to round it out a little. Any ideas welcome. Practical Pistol Reloaded is a straightforward, no-nonsense instructional book on pistol shooting, specifically – practical pistol competition shooting. Its take-no prisoners style holds nothing back, and eliminates any guess-work related to which techniques work and which ones are outdated. The best way to shoot is using the Isosceles Stance, fact or myth? What about the press-out technique? According to Professor Roger H. Lincoln, there are two rules for success in life: 1. Never tell everything you know. 2. Never tell everything all at once. In this book, Ben Stoeger laughs in the face of this great entrepreneur. Top shooters share a common knowledge which they have collected over the years from a plethora of sources. A knowledge that, in its whole, is far from common to the average shooter in that it is scattered. In this book, top shooters such as Bob Vogel, Dave Sevigny, and Matt Mink collaborate with the author, Ben Stoeger, to compile the so-called “Grand Master secrets” into one location. The knowledge spans from marksmanship fundamentals to shooting on the move, and competition skills such as stage breakdown and managing match pressure. Finally, this book contains many tips, drills, and exercises to help you improve your shooting. This book answers the “how to” questions about shooting technique. How do you hold the gun? How do you shoot fast? These questions and many more are answered inside. This material is geared for the USPSA, IPSC, or IDPA action shooting competitor. 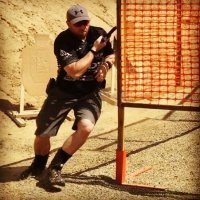 This is the revision to Ben Stoeger’s book “Practical Pistol”. This new edition is revised to reflect technique changes that have taken place over the last few years. The sport of Practical Shooting is changing quickly and becoming more competitive every day. This updated version of “Practical Pistol” is a must have for any serious USPSA or IDPA shooter. I have a 2011 edge chambered in .40 and have a trigger issue. The trigger will some times be very difficult to pull while a mag is in. I have tried a few different mags with the same result. With the mag well empty it is a very pleasant 2.5lb crisp trigger. I am tempted to buy one of those trigger bow stirrup die to check the bow but thought I would see if anyone has ever had this experience first. When I look into the mag well I can't see anything obvious. Also the mags drop free as is they are not hanging up on the bow. Keep accidentally hitting Gen4 Glock 22/35 mag release - any fixes? Hey guys, I keep accidentally hitting the mag release on my Gen4 Glock 35 and dropping mags. Doesn't happen during live/dry fire, but it keeps happening when I'm running around a match I'm guessing my support hand either moves up/forward or I squeeze too hard being all amped up, and I end up releasing the mag -- only reason I don't end up scattering mags across the range like a horse dropping poop all over the place is because I'm gripping the gun firm enough that the mag won't drop Glock is 100% OEM/stock, except for sights and a powder puff recoil spring Have any of you had personal experiences with this problem and, even better, fixing it? Potential fixes I've thought about: 1) Move support hand lower or backward -- I don't like this, as I like to Vogel-power-clench my Glock as high/forward as possible to help control recoil better 2) Change/modify mag release -- my short thumb already has a hard time reaching for the mag release when I DO want to spit that mag out; also, I'm concerned doing so will kick me outta USPSA Production Would appreciate any thoughts/comments. Thanks! What mag pouches that are Production and IDPA legal, do you guys think are the best? OK my 38 super mags are about 15 years old and have had thousands of rounds through them. Where the rim hits the mag lips have really become indented and rounds are hard to push out of the mag and some get locked down in the tube, The death rattle. I have tried new springs and followers and tried to tune them and cracked 3 in the process, they have never been tuned. But my question, are they worth tuning or can they be tuned or should I buy new ones and have them tuned. Just not sure if they can be tuned, any thoughts would be appreciated. Is there any source for mag springs for the SR9c? Everywhere I look only entire mag assemblies are offered. Replacement Mag Springs for Ruger SR9 Compact? I cannot seem to find any replacement springs for the mags of my ruger SR9 compact. Does anyone know of a source? I hate to spend the money for complete new mags. Which length Dawson Posi-Lock mag release do you use? I got 3 New arredondo mag extensions today, installed fine but i can only comfortably fit 19 in. 20 rounds in bending the glock mag loader and i feel like im breaking something. Is this normal? after the springs sit loaded for a while does it get easier to load like glock mags? Does anyone happen to have a Template (makeshift or exact) for witness hole placement in an STI 9/38 140mm mag?